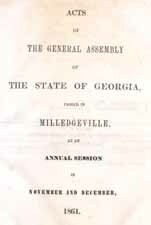 Georgia Acts of the General Assembly of the State of Georgia, Passed in Milledgeville, at an Annual Session in November and December, 1861. Acts of the General Assembly of the State of Georgia, Passed in Milledgeville, at an Annual Session in November and December, 1861. Milledgeville: Boughton, Nisbet & Barnes, State Printers, 1862. Georgia -- Politics and government -- 1861-1865.